I saw one of the best punch up’s I’ve ever seen take place on a football pitch on my only previous visit to the Birches Head Road ground of Abbey Hulton United. 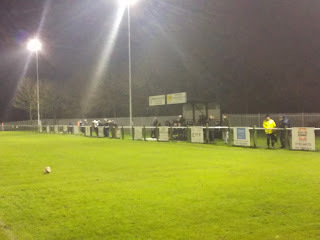 It was March 2011 and United were playing a Staffordshire County Senior League game at home to Alsager Town Reserves. The score was 2-0 to the visitors when the hosts prodded the ball home from a scramble inside the penalty area. Clearly with momentum on their side, Abbey Hulton were keen to retrieve the ball and get it to the centre circle promptly, but as sometimes happens in these cases, it somehow got stuck in the arms of a defender who was seemingly tangled in the back of the net. Boom! Up it went, punches, kicks, knees to parts of the body that would be easily damaged by a flying knee, the lot! This went on for a considerable period of time and by my estimations, I could count at least six players who could have been dismissed for violent conduct. But as often happens, the officials had absolutely no idea who had done what to whom, and as the battlefield was slowly cleared, body by body, and calm was restored, it was time for the card show! Two reds were shown, one each, for purposes of evening it out I can only assume. The one for the Alsager player was probably about right as I seem to think he connected with a right uppercut, but the Abbey Hulton player was a more baffling one as I think he’d spent most of the incident on the edge of the box shaking his head in disbelief. 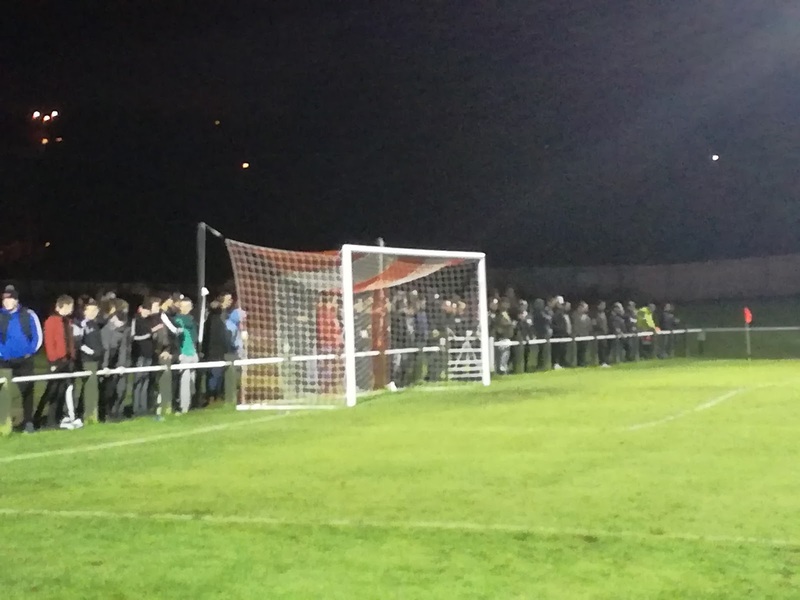 Anyway, we eventually got going again and Alsager came out 4-1 winners, and to be fair, by the final whistle tempers had calmed and all seemed forgotten. Readers may remember I took in an Abbey Hulton game at the start of the season, the memorable and somewhat controversial encounter at St Helens Town that was abandoned in injury time as Hulton were about to take a penalty, due to the floodlights going out on a timer! It turns out, following comments made to me by several people, that the result of that game has since been allowed to stand, but I’ve yet to see anything official confirming that. So, in short, watching Abbey Hulton United has not been dull and not without controversy, what could possibly go wrong tonight? More later…. If someone had said to me a couple of years ago that the next side to make the move from the Staffordshire County Senior League to the North West Counties League would have been Abbey Hulton, with respect, I probably wouldn’t have taken it especially seriously. There were clubs who I thought might have considered it like Leek CSOB, Wolstanton United or maybe Milton United, but AHU were always very much under the radar. 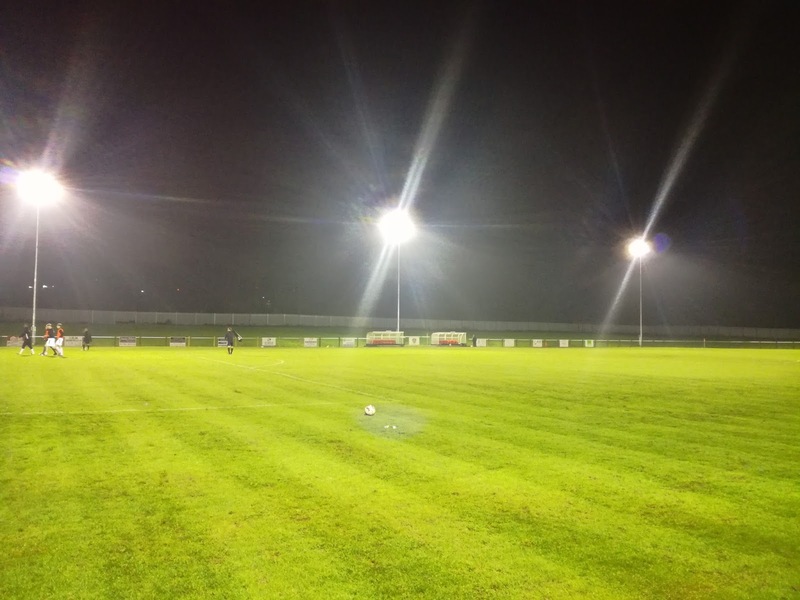 The work they have done though is tremendous, and from my last visit, they have fully enclosed the ground and the car park, installed hard standing, put in a seated stand, installed a refreshment area and put up floodlights. I haven’t seen what they’ve done ‘behind the scenes’ in terms of the dressing room etc, but I would imagine work has had to take place in that area as well. Ultimately, they’ve worked like Trojans and got a ground fit for Step 6, and fair play to them on achieving that, so with a meeting in Liverpool and the outskirts of Stoke-on-Trent very much on the way back, it was time to bob in and take a look. 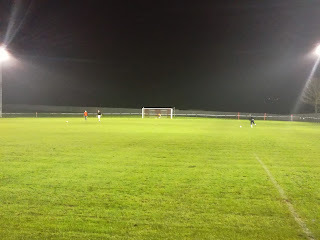 Alsager Town, who’s reserves I’d seen on my last visit when battle commenced. Alsager were sat on the cusp on the play off places, while AHU were around the half way mark in the table after a solid start to their debut season. I spent the game in the excellent company of Lee West, someone who I’ve known for several years now and from time to time I do bump into him at games around and about the area. Based in Southam, Lee is an extremely well travelled chap, having been to over 200 grounds in Germany alone. But, more importantly he’s a really great lad, despite being a Forest fan! 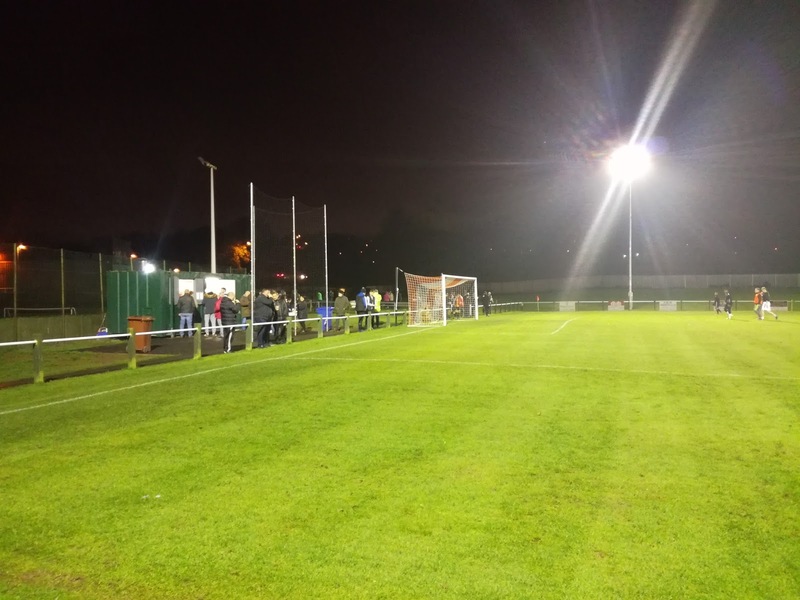 The game started, and so did the incidents…..
Dylan Bath gave the hosts a tenth minute lead with a great finish, but then we had a period of uncertainty when one of the linesman pulled up with an injury, did this mean the game would have to be abandoned? However, fifteen minutes later the game was re-started with a member of the crowd running the line. Within moments of the re-start it was 2-0 thanks to a close range finish from Josh Walker, and at this point Alsager looked on the ropes. At 2-2, the visitors were now well on top, and with five minutes left until the interval, they took the lead when Josh Glover found the net, it had been an amazing turn around in a half of football that had been anything but dull. The second half began with a further replacement linesman (after a slight delay), this time in proper kit, having been summoned from nearby Kidsgrove to replace the very able chap from the crowd who could clearly now go back to his pint and his pie! Alsager won a penalty that Brown was given the chance to score to complete his hat-trick, but his spot kick ended up somewhere on the road to Leek, however, the fourth and final goal of the game came just after the hour mark when Warren Holmes found the net to make it 4-2. Disaster was about to befall Holmes though, he went down in serious pain inside his own penalty area and it was clear he was in big trouble. It quite rightly took a considerable amount of time to get him off the pitch safely via a stretcher, and then within minutes an ambulance could be seen turning into the ground. As we left, Holmes was not yet in the ambulance but was still on the stretcher receiving oxygen, he looked in a bad way, and I’m sure all present wish him well in his recovery. It was getting on for five to ten when the game finally finished, and guess what, a notice was up in the bar stating the lights had to be off by 10pm, but no indication as given as to whether they were on a timer! 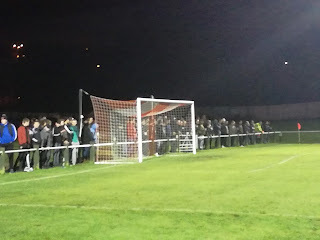 So, another memorable game watching Abbey Hulton United, and do you know what, I could forgive them for telling me not to bother in future, it never seems straightforward when I pitch up does it? Tea Bar / Burger Bar - You Name It, They Sell It!